The author contacted the Editor-in-Chief about statistical irregularities in this article in July 2012. The Editor-in-Chief thoroughly investigated this article and other preceding papers from the same database. On this basis, the Editor-in-Chief made the decision to retract the paper. The grounds for retraction are an error in statistical analyses, an omitted variable bias, and a “new” measure that was not “new” because it was already used in Lichtenthaler, U. and Ernst, H., Res. Policy, 36 (2007) 37–55, http://dx.doi.org/10.1016/j.respol.2006.08.005. These errors undermined the review process and are too substantial for a corrigendum. This appears that like retractions #1, #5 and #6, it was by mutual agreement. However, unlike at SMJ, the editor thoroughly investigated the problems rather than just letting the author withdraw his paper. 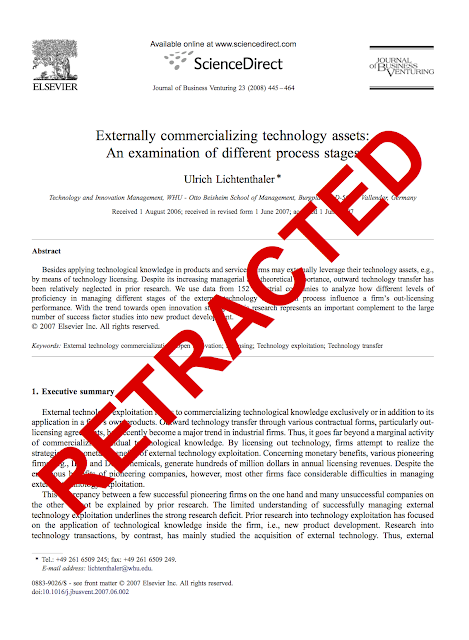 As with the RP retraction, Elsevier has placed a big red “Retracted” on every page (the other journals didn't seem to use red). For paper #7 — the recent Organization Science retraction — Retraction Watch reported (as I meant to) the number of citations to the retracted paper (15 in Google Scholar). The JBV article is the most cited of the eight retracted papers, with 34 citations. But five Lichtenthaler papers — in AMJ (2009), IEEE Transactions on Engineering Management (2008), Journal of Management Studies (2009), R&D Management (2006) and the International Journal of Management Reviews (2006) — all have more than 100 citations. Both the AMJ and JMS papers are about absorptive capacity, but otherwise I have no reason to expect that any of Lichtenthaler’s most cited work will be retracted. While the scandal has tarnished his reputation, every month Prof. Lichtenthaler continues to get new citations to his research, with at least 56 citations in 2012 so far to the AMJ paper. The retractions are well known in the open innovation community — causing many OI-focused researchers to stop relying on his work — but the larger innovation management community seems to be unaware of the issues. Below is the complete list of retracted articles to date. For consistency with my discussion of the retractions, I will now list them in the order announced.